Set in the turbulent times of twelfth-century England when civil war, famine, religious strife and battles over royal succession tore lives and families apart, The Pillars of the Earth tells the story of the building of a magnificent cathedral. Originally published in 1989 it became author Ken Follet's best selling novel worldwide. It remained a stand-alone novel until 2007 when a sequel 'World Without End' was published. Having chosen 'The Pillars of the Earth' as a last minute holiday read (literally picked it up at the airport because it was big, paperback and had small font) I was pleasantly surprised that my decision didn't let me down. Not only was I reading solidly for the duration of the trip, but I was introduced to a historical epic that was highly enjoyable. Due to the length of the book (it's quite a tome at 1072 pages!) it allows for a lot of character development, and is set over a period of 50 years or so. Within 100 pages I really had a feel for 2 of the main protagonists in the tale, Tom Builder and Philip the Monk, and the other key players were fleshed out and built upon as the story progressed. As somebody who really needs to 'feel' the characters in whatever I'm reading, I found that 'Pillars' fed my need for good guys, bad guys, strong women and troubled men aplenty, while having lots of subordinate characters to keep them from becoming boring and too much of a focus. As I mentioned it earlier, the cathedral is as important to the story as the characters themselves. The author spends a great deal of time and effort explaining specific features and aspects of cathedral construction. I highly recommend, though it is quite heavy going, taking the time to read these passages in detail and avoid the temptation to skim over them to get back to the 'real plot'. 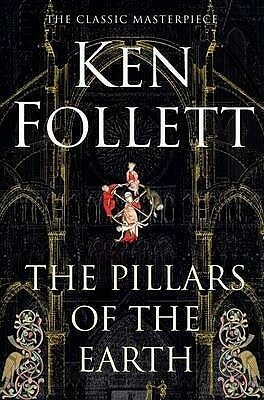 It is obvious that Follett undertook extensive research on this topic and his descriptions helped me to appreciate what hard work it was for people to build such magnificent structures at that time in history, and the struggles the characters face. The book does have its faults. Follett’s writing was not all that consistent. It was jarring to read grandiose descriptions of cathedrals and then, on the next page, read about William Hamleigh ogling women while fantasizing about the violence he wants to inflict on them. The violence was graphic, almost to the point of being gratuitous, but then again everything about Follett's writing is graphic. I personally take no issue with graphic violence, but people who do should take note that the prose of this novel is in-your-face blunt. Faults aside, the sheer force of the story compelled me to give this five stars. It’s not a perfect novel, and the novel doesn't showcase perfect writing. But it’s a really good story, something so grand and epic that it can’t be adequately captured in just a few sentences. I highly recommend it for anybody looking for a fiction to lose themselves in for a good few hours.